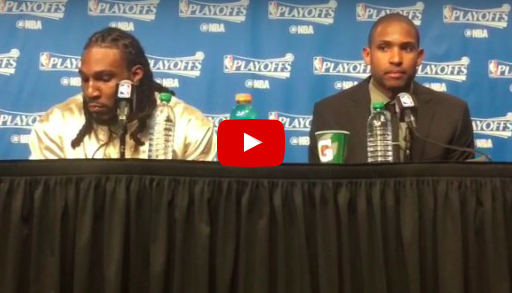 A dejected Jae Crowder and Al Horford talk to the press after another loss to the Bulls. Isaiah Thomas was obviously excused from taking part in the mandatory post game press conferences. Below here from Celtics head coach Brad Stevens as well as Bulls head coach Fred Hoiberg. The latter likely saved his job with the Bulls run to end the season, make the playoffs, and now go up 2-0 against the 1 seed. Also hear from Bulls Rajon Rondo, Dwyane Wade and Jimmy Butler. Honestly Robin Lopez deserved to be on that stage too. Videos courtesy of Mike Petraglia.